Look at the original, big version. Bridge / Super-Zoom Camera set to aperture priority, f/3.5, forced flash and macro mode. Quick reactions needed to grab camera and take as many shots as possible! I took this photograph in April 2009, and I think it's one of my best efforts from that year, so I'd like to share some of the planning, and luck, behind the image. Back in the Summer of '09 I was shooting with my beloved Fujifilm S5700 / S700, a great bridge / superzoom camera. The real advantage of this type of camera over a dSLR is that the little Fuji has a zoom lens that covers a massive focal length, from macro right through to telephoto, without having to change the lens. For macro (and super macro) you do have to tell the camera to focus closer, but that's one press of a button on the back of the camera, a much quicker exercise than having to swap lenses on my Canon EOS 350d / Digital Rebel XT. Anyways, back to the shot. I was in our Garden cleaning the paddling pool when I heard a frantic buzzing from one of the bushes that covers a garden wall. 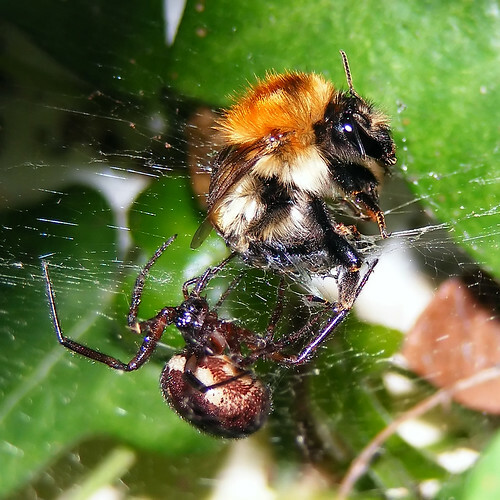 I had a quick look and saw this bee trapped in a web, having a tussle with a spider. I ran upstairs to get my S5700, and as I headed back down I was setting up the camera to grab a photo which I knew could be interesting if I approached it right, and most important, quickly. I checked the ISO and set it to 64, the lowest setting (for maximum image quality), dialled in aperture priority mode with an aperture of f/3.5 to maximise the amount of light coming into the camera. In hind-sight I could have gone smaller with the aperture to increase the depth of field (or how much of the photograph would be in focus), but f/3.5 still worked out ok. I checked that the Fuji was shooting at its maximum quality, and pressed the right-hand control button on the back to enable "forced flash". I knew there wasn't much light in the bush, I didn't have time for a tripod (and the wriggling insects would have come out blurred), so flash was a necessity. Finally I pressed the "macro" button on the back of the camera because I knew the subjects would be too close for normal focussing. All this happened as I was coming down the stairs and into the garden (I knew my S5700 really well! ), so my camera was set up to capture this battle. I approached the bush, flicked on the "Live-view" screen on the back of the camera, and just started shooting. I must have taken about twenty photographs, of which the above image was the best. In post processing (Photoshop) I added saturation, contrast, sharpening (high-pass filter), and cropped to a square. I still love this photo today, although I do want to get around to re-doing the post-processing to see if I can do it a little better. (ps I did rescue the Bee in the end and it flew off quite healthily).